The so-called Salerno ivories comprise more than sixty carved plaques datable between eleventh and the twelfth centuries, combining Islamic, Byzantine, Coptic, and western Christian features. They present superb craftsmanship and display numerous biblical scenes as well as portraits of saints and magnificent decorative ornaments. In medieval times as today constituing one of the most precious and impressive treasures of the Cathedral of Salerno, they have attracted the attention of many historians and art historians, who have tried to contextualize the ivories in the medieval history of Salerno, southern Italy, and the Mediterranean. Yet they remain enigmatic, as do the many questions concerning their date, place of production, patronage, function, and possible audience. Accompanied by new photographs produced in a campaign sponsored by the Kunsthistorisches Institut in Florenz – Max-Planck-Institut, which for the first time presents the ivorie’s backs and oblique views as well as the reliefs, the volume brings together articles written by scholars with different backgrounds and perspectives on medieval art. 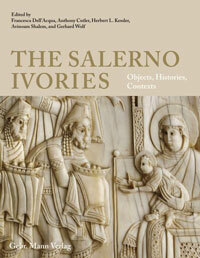 It presents the Salerno ivories in an interdisciplinary approach and sheds new light on their important position as mirroring the visual culture of the ›Mediterranean‹ at the age of intense commercialism and cultural exchange. Über 60 sogenannte Salerno-Relieftafeln aus Elfenbein (11.-12. Jh.) bilden einen kostbaren Schatz der Kathedrale von Salerno in Süditalien. Die Darstellungen vereinen islamische, byzantinische, koptische und abendländische Einflüsse und gewähren Einblick in die visuelle Kultur des Mittelmeerraums in einem Zeitalter enger Handelsbeziehungen und kulturellen Austauschs. Die herausragende Elfenbeinschnitzkunst zeigt biblische Szenen ebenso wie Heiligenfiguren oder prächtiges Ornament. Sie zu datieren, ihre Herkunft zu bestimmen oder in der mittelalterlichen Geschichte Salernos zu verorten, ist bisher nicht eindeutig gelungen. Wer waren die Mäzene? Was war die Funktion der Tafeln, und an welche Zielgruppe richteten sich die Darstellungen? Beiträge verschiedener Disziplinen, entstanden im Rahmen des internationalen Forschungsprojektes „Mediterranean Cross-Currents: The So-Called Salerno Ivories“ vereinen in diesem Band neue Perspektiven auf mittelalterliche Kunst. Sie beleuchten Produktionsweisen, Ikonografie, Funktion und Rezeption. Francesca Dell'Acqua is Marie Curie Fellow at the Centre for Byzantine, Ottoman, and Modern Greek Studies, University of Birmingham (2015¬¬–17), where she investigates the Western response to the Byzantine iconoclasm. She is interested in the materiality of objects and their contribution to cultural history and traditions in the Medieval West and the Mediterranean area. Anthony Cutler is the Evan Pugh Professor of Art History at Penn State University. He is an international expert on ivory carving with numerous works. Herbert L. Kessler is Professor Emeritus of Johns Hopkins University (Baltimore). He is currently an Invited Professor at the Masaryk University in Brno; a Fellow of the Medieval Academy of America and the American Academy of Arts and Sciences, he is the author or editor of some 20 books and nearly 200 articles and reviews. Avinoam Shalem is the Riggio Professor of the arts of Islam at the Columbia University. His main field of interest is in medieval artistic interactions in the Mediterranean, medieval aesthetics and the historiography of the field. Gerhard Wolf is Director of the Kunsthistorisches Institut / Max-Planck-Institut in Florence (since 2003) and honorary professor at the Humboldt-Universität zu Berlin (since 2008). His main research fields and projects include Mediterranean art histories and pre-modern globalization, theories of the image, as well as sacred topographies in an interreligious perspective. With contributions by Pietro Baraldi, Gabriella Bernardi, Patricia Blessing, Maria Cristina Carile, Jill Caskey, Fabrizio Crivello, Anthony Cutler, Francesca Dell'Acqua, Antony Eastmond, Maria Evangelatou, Giovanni Gasbarri, Giovanni Guardia, Sarah M. Guérin, Herbert L. Kessler, Ruggero Longo, Antonio Milone, Elisabetta Scirocco, Avinoam Shalem, Francesca Tasso, Natalia B. Teteriatnikov, and Gerhard Wolf. Rather than foreclosing future debates, this book opens up its topic in important new ways, and equips readers with invaluable images and ideas that promise to spark discussion for many years to come.